for my brother's "return home" dinner, I made some delicious mexican food. 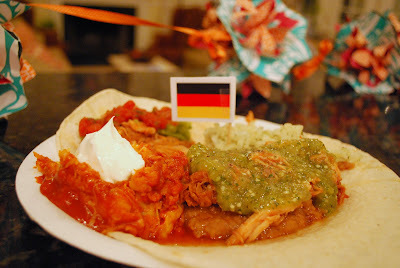 don't be fooled - that's not a mexican flag sticking out of green salsa. it's the german flag because that's where my bro returned from. hopefully I learn how to make a few german dishes here soon (such as: Spätzle, Klöße, Kalter Hund) so I can post them. in the mean time, here are two recipes that you won't be sorry you made. *disclaimer: I will hunt you down if you do not follow the cooking time for this recipe exactly. it does not get easier than putting meat in the crockpot all day and letting it go to town. mix together ingredients for sauce and pour over pork tenderloin in crock pot. cook on low for 8-9 hours. that's it suckers. *disclaimer: the recipe for the salsa is not exact. I manipulated a recipe I found online and didn't write down the changes I made - mostly guessed. deal with it. remove husks from tomatillos and rinse under warm water to remove stickiness. lay chiles, garlic, chopped onion and fresh tomatillos on a cookie sheet (evenly spread). drizzle with olive oil. place sheet on rack of a broiler pan 1 to 2 inches from heat, turning once, until tomatillos are softened and slightly charred, about 7 minutes. remove from oven and peel garlic and pull off tops of chiles. purée all in a food processor with cilantro. slowly add kosher salt and sugar to taste. Liz, that tomatillo salsa was TO DIE FOR! I can't wait to try this recipe. YUM! I seriously want to try these recipes. I love this blog--PLEASE keep posting! I am going to try this recipe, it looks amazing! How and what else did you serve with it? 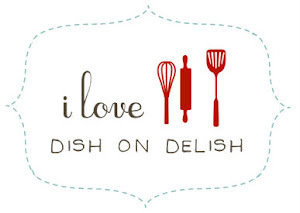 I really enjoy your blog and the recipes....please keep posting! we loved the roasted pork! I couldn't find the El Pato sauce here in Hawaii, but had my daughter look on the internet for the ingredients and used something almost the same. Can't wait to ship it here. We had fresh avocados from the neighbors tree with it...yum! Okay Liz, this looks delicious. In fact, everything on this entire blog looks wonderful. This includes the salmon, which I have been meaning to like. I've never liked fish but I want to, so this will be a great resource for good fish recipes. And maybe next time I'm at Rosa's I'll have to try their salmon tacos. Who knows? I might become a fish lover. I must go to the store now.